Applebaum started his statement by saying: “…There is a big difference between a for-profit business and the business of educating students K-12. Anyone who says “you should run a public school district like a business” is out of touch with reality. And anyone who says a “privately run for-profit business can educate our students better than those who are entrenched solely in the public education of our students” is greatly mistaken. This passion and eagerness to fight for change were carried through his statement. It is no secret that ECOT has drained over $1 billion out of more than 600 school districts since its beginning. 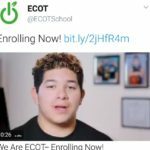 Officials, in every school district, should be informing the public about the impact of the ECOT scam on their respective communities. ECOT’s charade is the tip of the iceberg in the charter industry. There are a lot of other bad actors in the charter world. More corruption in the industry is about to be exposed.